^ 1.0 1.1 Saudi Arabia. WorldStatesman. Ben Cahoon. [23 March 2018]. ^ King Faisal assassinated. HISTORY.com. 9 February 2010 [25 December 2018]. ^ "King Faisal: Oil, Wealth and Power", TIME Magazine, 7 April 1975. ^ King Faisal Ibn Abdul Aziz Al Saud, Saudi Arabia. [25 June 2012]. ^ The kings of the Kingdom. Ministry of Commerce and Industry. [28 July 2012]. （原始内容存档于22 October 2012）. ^ Nabil Mouline. Power and generational transition in Saudi Arabia (PDF). Critique Internationale. April–June 2012, 46: 1–22 [24 April 2012]. ^ Wahhabism – A Unifier or a Divisive Element. APS Diplomat News Service. 7 January 2013 [26 March 2013]. ^ Alexander Bligh. The Saudi religious elite (Ulama) as participant in the political system of the kingdom. International Journal of Middle East Studies. 1985, 17: 37–50. doi:10.1017/S0020743800028750. ^ Leon Hesser. Nurture the Heart, Feed the World: The Inspiring Life Journeys of Two Vagabonds. BookPros, LLC. 30 November 2004: 104 [27 February 2013]. ISBN 978-0-9744668-8-0. ^ Mark Weston. Prophets and Princes: Saudi Arabia from Muhammad to the Present. John Wiley & Sons. 28 July 2008: 129 [27 February 2013]. ISBN 978-0-470-18257-4. ^ Mohammad Zaid Al Kahtani. The Foreign Policy of King Abdulaziz (PDF). University of Leeds. December 2004 [21 July 2013]. ^ 17.0 17.1 Fayṣal (King of Saudi Arabia). Encyclopedia Britannica. 20 July 1998 [25 December 2018]. ^ Ghassane Salameh; Vivian Steir. Political Power and the Saudi State. MERIP. October 1980, (91): 5–22. JSTOR 3010946. doi:10.2307/3010946. ^ Mofa.gov.sa. mofa.gov.sa. [24 January 2015]. ^ T. R. McHale. A Prospect of Saudi Arabia. International Affairs. Autumn 1980, 56 (4): 622–647. JSTOR 2618170. doi:10.2307/2618170. ^ Seminar focuses on King Faisal's efforts to promote world peace. Arab News. 30 May 2002 [11 August 2013]. ^ 22.0 22.1 King Faisal, Encyclopedia of the Orient, http://lexicorient.com/e.o/faisal.htm, Retrieved 27 March 2007. 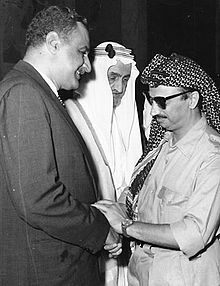 ^ A history of treason – King Faisal bin Abdulaziz bin Abdul Rahman Al Saud. Islam Times. 22 May 2014 [5 November 2014]. ^ 25.0 25.1 Rachel Bronson. Rethinking Religion: The Legacy of the US–Saudi Relationship (PDF). The Washington Quarterly. 2005, 28 (4): 121–137 [8 April 2012]. doi:10.1162/0163660054798672. ^ Kechichian, Joseph A. Succession in Saudi Arabia. New York: Palgrave. 2001 [12 June 2018]. ^ Sherifa Zuhur. Saudi Arabia. ABC-CLIO. 31 October 2011: 52 [6 March 2013]. ISBN 978-1-59884-571-6. ^ Nadav Safran. Saudi Arabia: The Ceaseless Quest for Security. Cornell University Press. 1985: 217 [4 April 2013]. ISBN 978-0-8014-9484-0. ^ Tietelbaum, Joshua. "A Family Affair: Civil-Military Relations in the Kingdom of Saudi Arabia" (PDF). [25 June 2008]. （原始内容 (PDF)存档于25 June 2008 ）. 无效|dead-url=bot: unknown (帮助); 请检查|archive-date=中的日期值 (帮助), p. 11. ^ Roham Alvandi. Nixon, Kissinger, and the Shah: the origins of Iranian primacy in the Persian Gulf (PDF). Diplomatic history. 2012, 36 (2): 337–372 [2 August 2013]. doi:10.1111/j.1467-7709.2011.01025.x. （原始内容 (PDF)存档于20 July 2013）. ^ Mai Yamani. The two faces of Saudi Arabia. Survival. February–March 2008, 50 (1): 143–156. doi:10.1080/00396330801899488. ^ 37.0 37.1 Mordechai Abir. The Consolidation of the Ruling Class and the New Elites in Saudi Arabia. Middle Eastern Studies. 1987, 23 (2): 150–171. JSTOR 4283169. doi:10.1080/00263208708700697. ^ Educated for indolence. The Guardian. 2 August 1999 [12 June 2018]. ^ TIME Magazine – U.S. Edition – 10 March 2014 Vol. 183 No. 9. time.com. 10 March 2014 [24 January 2015]. ^ Fred Halliday. Political killing in the cold war. Open Democracy. 11 August 2005 [17 July 2013]. ^ Man in the news. King Faisal. The Telegraph. 5 November 1964 [21 July 2013]. ^ Jardine, Cassandra. 'There's such ignorance about us'. The Daily Telegraph. 12 December 2005 [2 May 2011]. ^ James Wynbrandt. "A" Brief History of Saudi Arabia. Infobase Publishing. 2010: 236 [16 December 2016]. ISBN 978-0-8160-7876-9. 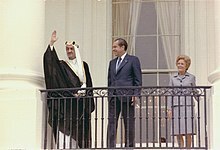 ^ 1975: Saudi's King Faisal assassinated. BBC. 25 March 1975 [17 July 2013]. ^ Commins, David. The Wahhabi Mission and Saudi Arabia. 2006: 110. ISBN 1-84511-080-3. ^ Shaheen, Abdul Nabi. Sultan will have simple burial at Al Oud cemetery. Gulf News. 23 October 2011 [29 July 2012]. ^ Ross, Michael. Brother of murdered King assumes throne. Times Union. 26 March 1975 [2 August 2012].